American rock band Counting Crows have sold over twenty million albums in their twenty year career, and are about to release their first album for over four years - "Underwater sunshine". The album is their first independant release, and they've chosen to do something a little bit different. Rather than just writing a new album, they've decided to let their love of music loose and have chosen to release an album of cover versions of songs they love. Singer /songwriter Adam Duritz says "If you wonder why we didnt just write our own record, it's simply because we wanted to do THIS one. We now have the creative freedom to release albums like this and offer our fans more music than ever"
The songs come from a very diverse range of bands both young and old, well known and obscure. You'd think that with the songs spanning almost 50 years then they wouldnt fit well together but they've been chosen so well and interpreted in such a way that they all fit together beautifully. The whole album is excellent, but for me I think "Meet on the ledge" is probably my favourite track, but the album is so consistently good that I can see everyone having different opinions on the best song. In my opinion it's rare for an album of covers to be this good, and the fact that the songs all fit well together is testament to the talent of Counting Crows. 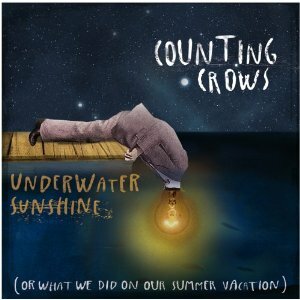 Hopefully Counting Crows fans who enjoy the album will check out some of the artists who's songs have been covered - albums like this help highlight some great songs and bands that would otherwise have passed almost unnoticed or forgotten. I've had this album for a couple of weeks and kept putting off writing the review with the flimsy justification to myself that I should listen to it again before writing the review. Well I've listened to it countless times now, and even now the review is written I think this will be staying in my CD player for some time to come. An excellent album that all fans of the band should be buying.